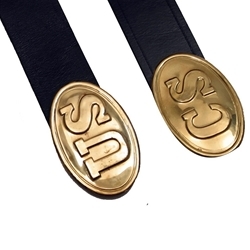 Civil War Waist Belt - Black Leather - Brass Buckle. These Civil War era waist belts are made from full grain black leather and are 1-3/4 inches wide. Comes with a solid brass three prong oval buckle with lead-filled back.